Two weeks ago, I was struck by the information on biology teachers that I read in the article On Evolution, Biology Teachers Stray From Lesson Plan (duplicate post that you don’t have to login in to read) by Nicholas Bakalar. At that time, I decided that I would share some of my thoughts and lessons that I used to teach evolution in my freshman Biology course. This particular lesson is the second of a series of activities that was conducted at the very end of the school year at the end of my unit on genetics after having covered standard Mendelian genetics and content associated with inheritance in humans. Background – In the early summer of 2002, I attended a Dolan DNA Learning Center workshop at the Stowers Institute where a group of biology instructors were introduced to one wet lab and a number of bioinformatics activities associated with their new educational program called Genetic Origins. Scott Bronson and Ewe Hilgert ran the workshop that specifically introduced us to the study of mitochondrial (mt) DNA and Alu genomic elements. Objective– For students to apply what they learned in the previous activitiy on comparing chimpanzee mtDNA seqeunces to the analysis to human mtDNA sequences, and to realize that mtDNA comparisons do not support the concept of distinct human races. Because the previous activity demonstrated that mtDNA sequences were supportive of their being geographic subspecies of chimpanzees, many students will assume that the data for human mtDNA sequences will be just as supportive of geographic categorization of humans into races (they may even remember that Linneaus had segregated humans into distinct categories as well, although I would not reminded them of this directly). Introducing the Activity – I do little introduction for this activity. Since they would have just complete the comparison of chimpanzee mtDNA sequences, they know what to do and appreciate being allow to just get started. Although I haven’t used these resouces in conjunction with this specific activity, they may be nice additions that would provide students with background on the diaspora of modern human. I would now consider having students view this video for homework, although it is short enough that it could be viewed after they finished the activity above. Here are some comments about Spencer Wells’ research on the TED website where this video is located. 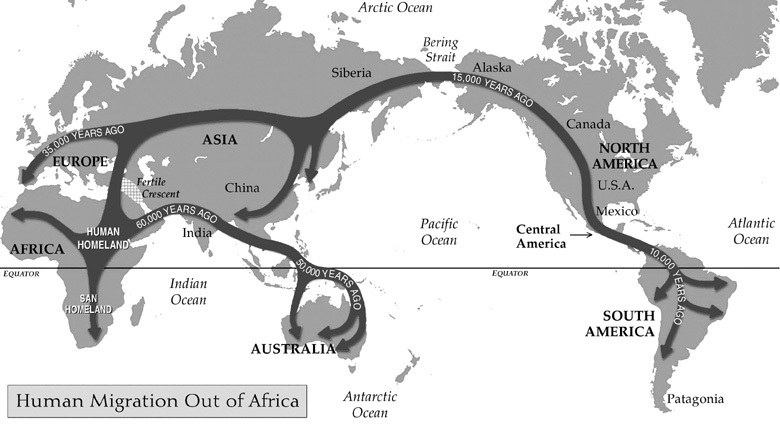 By analyzing DNA from people in all regions of the world, Spencer Wells has concluded that all humans alive today are descended from a single man who lived in Africa around 60,000 to 90,000 years ago. Now, Wells is working on the follow-up question: How did this man, sometimes called “Y chromosomal Adam,” become the multicultural, globe-spanning body of life known as humanity? Wells was recently named project director of the National Geographic Society’s multiyear Genographic Project, which uses DNA samples to trace human migration out of Africa. In his 2002 book The Journey of Man: A Genetic Odyssey, he shows how genetic data can trace human migrations over the past 50,000 years, as our ancestors wandered out of Africa to fill up the continents of the globe. Here are two NPR audio stories from this year that may be interesting as well, An Earlier Departure Out of Africa? (9:48) and Tools Suggest Humans Left Africa Earlier via Arabia (4:23). This is a great general introduction to Alfred Wallace and biogeography. It mainly discusses non-human animal life in the Malay Archipelago, but there is a reference to Tim Flannary and Jonathon Kingdon’ hypothesis that successful island hopping is responsible for making modern humans modern. This thought takes a more interesting twist with the more recentdiscovery of Homo floreseinsis on one of these Indonesian Islands. This is a great book that contains relevant background information on population genetics. I Teach Evolution! Do You? “Only 28% of biology teachers consistently describe straightforwardly the evidence for evolution and explain the ways in which it is a unifying theme in all of biology.” So, 72% of biology teachers don’t do this? Could this be true? “13 percent explicitly advocate creationism.” So, 59% may accept evolution in some manner but just don’t teach it? Wow! … this sad commentary reported during the week of Charles Darwin’s 202nd birthday! So, is there anything that we can do as a KABT community to help “better train” biology teachers in science and evolution? I really don’t know, but I thought I could at least share some of what I have done to teach evolution during my 18 years in the freshman biology classroom. Below, I relate the general structure of the freshman biology courses that I have taught, and the introductory setting that I tried to establish. These brief comments are followed by the first of a series of activities (other will be presented in future posts) which I have used to provoke a thoughtful and respectful discussion of the biological concept of race. After I finish with the series of posts on biological race, I will think about backing up and filling you in on some of the other activities, discussion, homework assignments, etc… that I used to teach the fundamental concepts of natural selection and speciation. I don’t claim to have expert knowledge of evolution, nor do I have special abilities when it comes to teaching evolution, but I can demonstrate that at least 25% of my class time in freshman biology was spent learning about evolution. Two of my 8 units, over the course of the year, were devoted to the topic, and I integrated the evolutionary perspective into some course work during my previous units on classification, ecology, as well as subsequent units on cell biology, cell energetics, molecular biology, and genetics. The activities that I will be presenting in this, and subsequent posts, were some of the culminating activites my students completed at the end of my unit on genetics second semester. Like many biology teachers, I began the school year establishing the difference between science and non-science through a few lessons where we covered concepts including empirical and rational epistemologies, observation, discovery-based and hypothesis-based science, and theory. One of my lessons was motivated by Brad Williamson, who introduced me to the Secret of the Psychics Nova video and the accompanying con he used to perform on his students (more on that later). One important goal of this introductory material was to set the appropriate tenor in the classroom. Although I have never had a single significant distracting classroom experience involving creationism with students or their parents, I thought it was important to develop a standard for what constitutes science from the beginning so that if later issues popped-up, they could be judged against this pre-established standard. This first of a series of activities was conducted at the very end of the school year at the end of my unit on genetics after having covered standard Mendelian genetics and content associated with inheritance in humans. Objective– To introduce students to the concept of subspecies through study of the geographic distribution of chimpanzee populations and a comparison of mtDNA from some of these isolated populations, in an effort to prime them for a discrepant event with regard to a similar activity involving humans (they may even remember that Linneaus had segregated humans into distinct categories as well, although I would not have reminded them of this directly). Introducing the Activity – When starting things off, I most would commonly show a map of the ranges of the subspecies of chimpanzee found in Africa (above). I would prompt the students to remember what we learned about scientific names from first semester (we had only learned about bionomials not trinomials), and proceed in having them hypothesize why these populations of chimpanzees were given distinct three word names. It was pretty clear to most students that the trinomials may represent a single species that has recently begun to develop geographically isolated populations. I would likewise prompt them to remember what we had discovered about processes of speciation (we had already learned about allopatric speciation and pre and post-zygotic isolating mechanisms), and have then hypothesize differences that may exist within mitochondrial DNA samples taken from three of the subspecies (see the activity below). Once some thoughts had been generated, I would model the procedure in the activity that follows, making sure that students understood how to cut the mtDNA sequences from the supplemental document below and successfully paste them into the appropriate online sequence alignment tools. Realize 1) that other alignment tools could be used (I always had problems with the Dolan Center’s online tools and googled this one up years ago) and 2) one can actually speed things up by pasting all the sequences at once. I usually showed the students the short cut later when we discussed their answers at the end of the class period or the following day. I imagine that using the slower process actually gave them time to think about the data as it was processed resulting in more thoughtful answers. In a subsequent activity with human mtDNA sequences, I would allow them to use the short cut because they would then have a good enough understanding of significance of what they were doing. Let everyone know if you have any questions or general words of advice in response to things said. Otherwise, thanks for your attention, and I will be talking to you again soon! Author Eric KesslerPosted on February 12, 2011 February 12, 2011 Categories Teaching ResourcesTags Africa, biological race, chimpanzee, chimpanzees, dna, Evolution, genetic origins, mitochondria, mtDNA, phylogenetic tree, race, sequence alignment, Speciation, species, subspecies, teaching biology, teaching evolution3 Comments on I Teach Evolution! Do You?